Highlights from Kzoo Sneak Peak! The Kalamazoo Sneak Peak is now available online! Marie de France: A Case Study of Cultural Shift and Literary Motherhood, Kimberly Tate Anderson, Florida State Univ. IMPORTANT! WE WILL BE ELECTING OFFICERS THIS YEAR! This entry was posted in Kalamazoo on January 10, 2016 by president. Whalen, Logan. “Animals as Performers and Communicators in Marie de France’s Guigemar, Bisclavret, and Eliduc. This entry was posted in Le Cygne on December 16, 2015 by president. 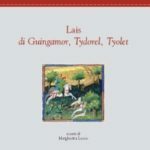 Edizioni dell’Orso announces an all-new Italian translation of the anonymous Breton lais Guingamor, Tydorel, and Tyolet. The volume includes a scholarly presentation of the lais as well as a Glossary and Bibliography. For more information, visit the Website (in Italian). This entry was posted in publication on October 6, 2015 by president. The International Marie de France Society is pleased to announce three (3) panels for the International Congress on Medieval Studies at Western Michigan University, Kalamazoo, May 12-15, 2016. The entire “Sneak Peak” is available online. This entry was posted in Kalamazoo on June 29, 2015 by president. We are in the process of digitizing and loading copies of Le Cygne: The Bulletin of the International Marie de France Society. This publication lasted three years (1995-1997) before being reinvented as Le Cygne: The Journal of the International Marie de France Society. They will soon be available under the Archive tab. This entry was posted in Le Cygne on June 17, 2015 by president. In advance of the International Congress on Medieval Studies, Kalamazoo, Michigan, May 13-17, 2015, here is a list of papers and panels of interest to IMFS members. Speakers with asterisks are also members of the Society. For additions or corrections, please comment below. Michael A. Johnson, Central Washington Univ. This entry was posted in Kalamazoo on April 22, 2015 by president.